Buyers should be on a severe safety alert for any products marked as Krypton Kratom. While on the surface this product seems like it just might be one of the new branded kratom extract labels that importers are slapping on head shop products, the truth is far worse. Thanks to user reports and much sleuthing, it has been revealed that this product is not what it claims to be, and is in fact, quite dangerous. Read on to find out why Krypton Kratpm pills are indeed a huge health hazard and should be avoided. Krypton Kratom – Dangerous Ingredients? 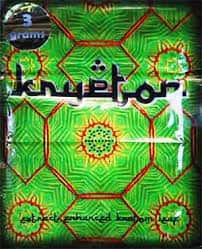 It has been uncovered that the Krypton Kratom drug is not a traditional kratom powder or extract and may in fact be dangerous to use. In fact, it is a blend of caffeine and O-desmethyltramadol, a synthetic opioid. This is a shocking bit of information. Real kratom is made from the unrefined leaves of the Mitragyna Speciosa tree of Southeast Asia. The leaves are dried, crushed, and then ground into a fine powder, which is consumed orally. Used safely for thousands of years, this herbal remedy is known for many health benefits, like lowering blood pressure and cutting stress. Well, disingenuous marketers have tried to pull a fast one on the public by using the kratom name on a product that is not kratom. This blend of synthetic opiates is extremely strong and some say extremely toxic. In fact, taking just .5 grams of Krypton is said to be the equivalent of 60 grams of morphine. This is an extremely dangerous dose and could lead to severe health problems. O-desmethyltramadol is a tramadol analogue that binds with mu-opioid receptors at 200 times the strength of tramadol. This is an instantly, dangerously addictive substance. One of Kratom’s many uses is as a helper supplement which aids in the quitting of opiate addiction by cutting down significantly on withdrawal symptoms and placating damaged cell receptors. It is very unfortunate to report that anyone who takes Krypton Kratom 50x extract for this purpose, for example to ease off of a methadone addiction, will be seriously exacerbating their problem and creating a very harmful, far more addictive cycle. For this reason alone, we find the false marketing of this fake kratom product to be very irresponsible. What happens when the market is flooded with these impure, dangerous, fake kratom products? The legality of kratom is put into jeopardy. Lawmakers will find it even easier to group kratom leaf with dangerous “legal highs,” and ban it. Of course, we all know that Mitragyna Speciosa is not dangerous, addictive, refined, or cut with chemicals. That’s why it’s very important not to support bogus and harmful products like Krypton pills. If you are looking for a concentrated kratom experience, stick to safe, all-natural products like extract powders and tinctures. You’ll find that these ultra-powerful formulations will give you the intensified effects you’re looking for, without the terrible dangers of synthetic opioids and chemically cut products. This 15x Extract is highly rated and completely natural. A true extract is made by boiling down raw leaves directly from a kratom tree into a dense resin. The hard substance is then ground into a very fine powder, which we call extract. Extracts are rated according to strength and the amount of plant matter used to create them. So, in this example, at least 15 times the amount of kratom leaves were used to create each gram of extract. That’s extremely potent material, more than enough to dramatically intensify effects for almost all kratom users. There is no reason to experiment with dangerous synthetics when excellent natural products like these are available. It can’t be stressed highly enough – Krypton Kratom is not real kratom, and should be avoided. It is unclear if the manufacturers are knowingly trying to jump on the coattails of recent kratom popularity when they falsely name their products like this. It is not our place to determine if their products should be legal, however, it is unfair and dangerous to give consumers a harsh synthetic under the name of kratom. If you are looking for kratom, do not ever buy Krypton legal high pills. This is especially true is you are currently battling any form of opiate addiction. Real kratom can offer you a way out – but please don’t get suckered by fake and dangerous products like Krypton Kratom opiates.